Word search puzzles don’t just give your kids good reading practice; they are a lot of fun too. No wonder then, they are always big hits with the little ones. 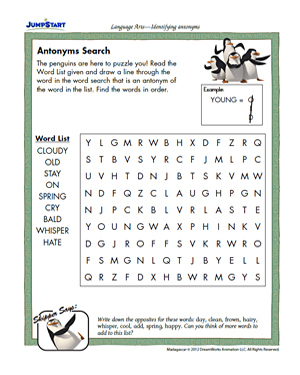 This fun and printable worksheet, however, brings forth a word search puzzle that is like no other. Instead of looking for and encircling the words mentioned in the list, here, players will be striking out the antonyms of the words listed. Sounds like fun? It sure is!